Where can you find a big, pink, French cartoon that has its own café? In Saitama, Japan, that’s where! From the minds of American and French duo, Barbapapa is the name of the lovable children’s character that was drawn up by Talus Taylor and Annette Tyson in the 1970s. 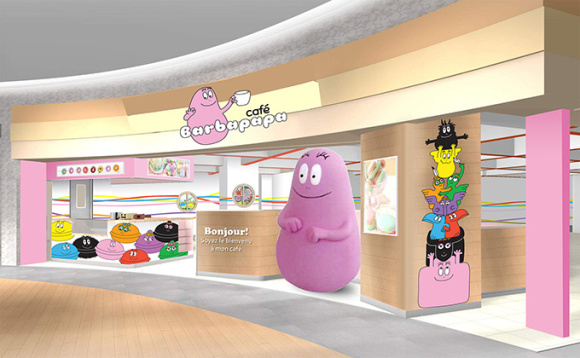 Now, banking on the nostalgia of Japanese fans and foreign visitors alike, Barbapapa Café is open to the public. The name Barbapapa (which coincidentally is also the species of the fictional character) comes from a misunderstanding of the French word for cotton candy, barbe à papa, meaning daddy’s beard or candy floss. Modeled after the sugary treat, Barbapapa is a pink, pear-shaped blob who lives in a world of humans. It was originally published in France, though quickly found an audience all over the world. Since the 70s, Barbapapa has been adapted to other forms of print media, to television, and even to the Google doodle. Barbapapa goes on many adventures in the world humans, teaching valuable lessons on exploration and musicality. One of the hallmark of the series is its critical look at environmental responsibility; Barbapapa teaches us that we have to take care of nature and the world that we live in. These adventures have been translated into over 30 languages, and are treasured by many. For under $10 (or ¥1100), fans can eat stuff like Barbapapa-face pancakes with a fresh fruit salad parfait, a dollop of whipped cream with star candy, and pink chocolate cookie. Maple syrup comes on the side for those who want to dress their hotcakes with sticky face paint. For about $11 (or ¥1280), diners can have a French style eclair topped with sweet icing that spells out the name of the series, “Barbapapa.” The sweet also comes with a fresh fruit salad, strawberry slices, mint, and an espresso cookie. If one is in the mood for a meal or sweets, they can order piping hot Barbapapa latte with the main character’s face drawn on the froth. You can’t help but smile with happy pink blob while you’re also sipping delicious coffee. In case you’re in the mood for something a little light but still filling, there are also avocado sandwiches, vegan burgers, curry, and vegetable pasta options. These are artfully plated and displayed to customers. Also take away gift, one can get a set of macarons and roll cake illustrated with characters from the cartoon. All of these can be yours for just about $17 (or ¥1900). If you’re not in the market to eat anything, you can also find super kawaii gifts to leave with. Barbapapa keyboards and mouses are available for $95 (¥10,800) and $35 (¥3888), respectively.